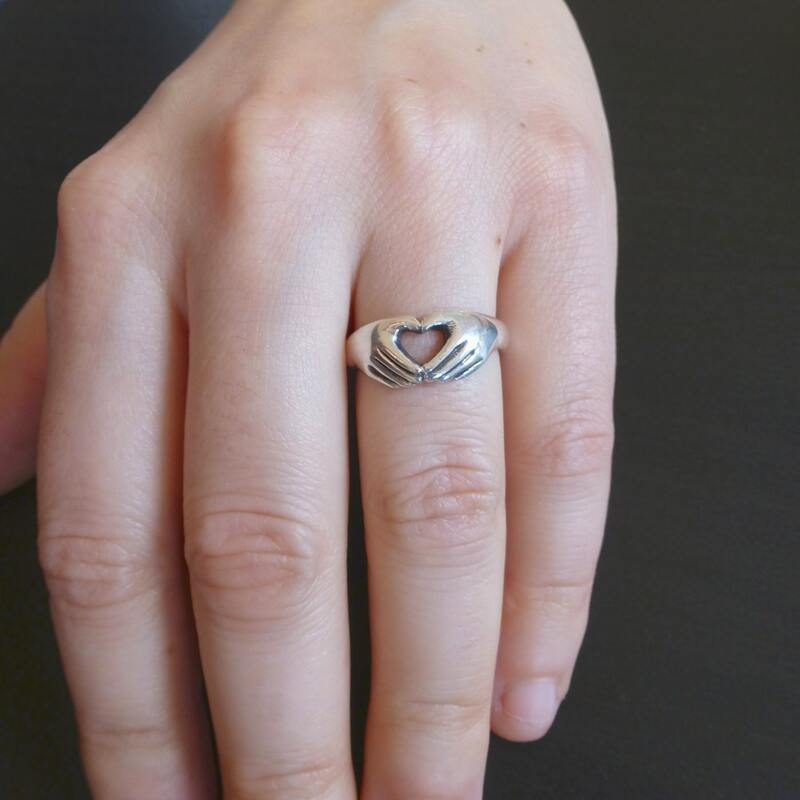 Show your love for your sweetie or for yourself with my take on the traditional Claddagh ring. 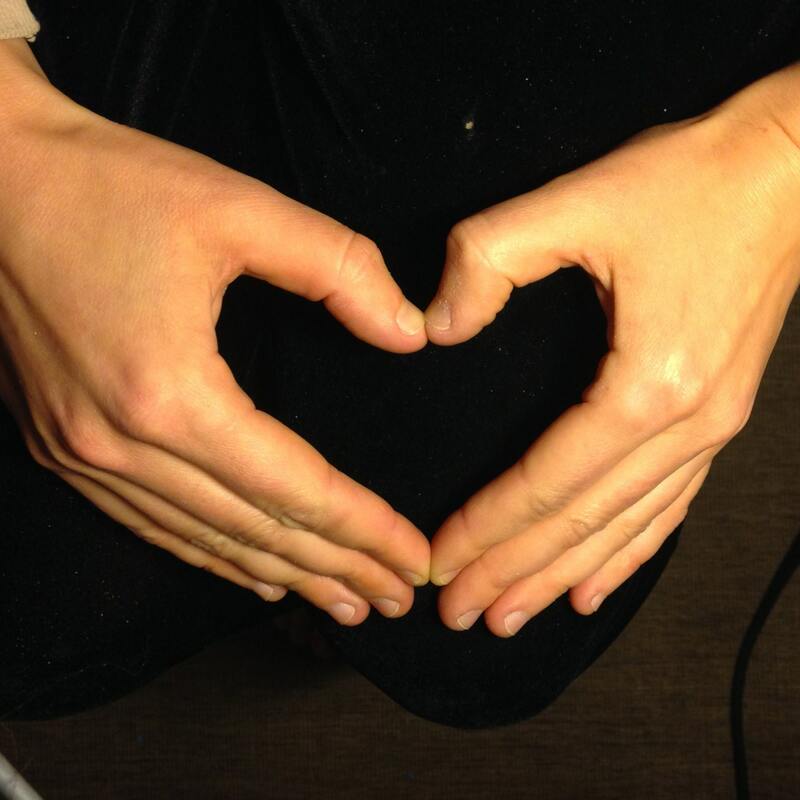 I love the simplicity of two hands joining together to form a heart. 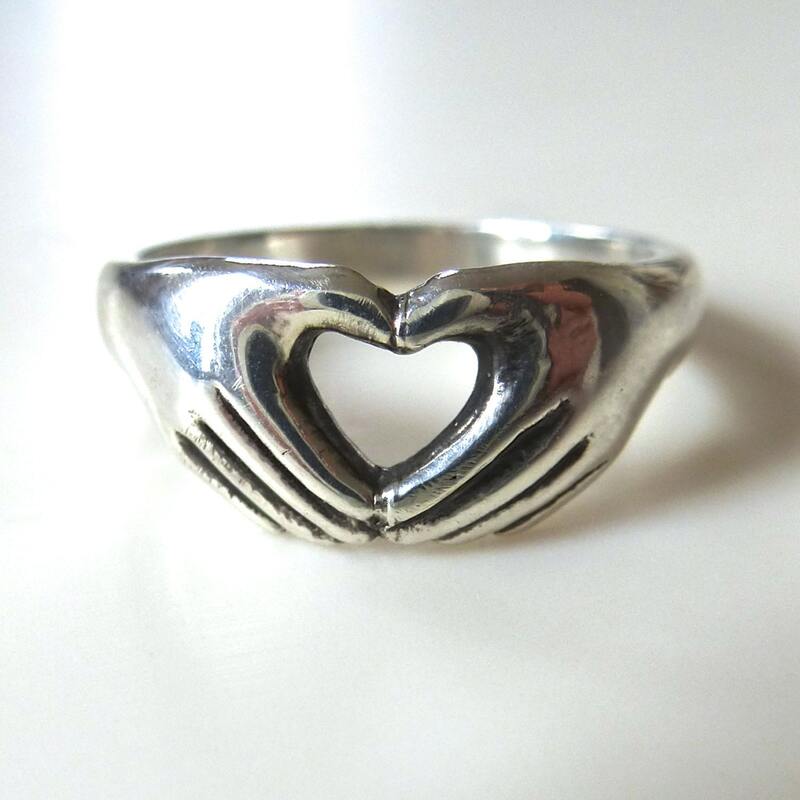 I hand carved the ring in wax and cast it in solid sterling silver. I have finished it to a high polish and oxidized the details. Zoom in! The ring shown is a size 7. I am happy to make it for you in any size you like. I can absolutely make this ring in other metals. 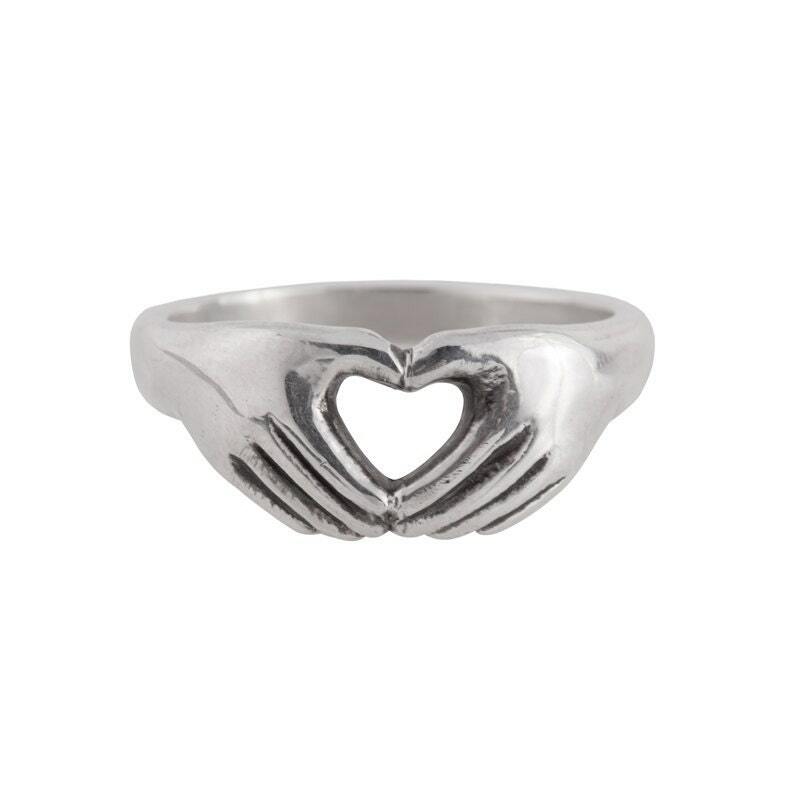 This would be such a lovely wedding ring in gold. I'd also love to make it with a heart shaped gem. All items are made from design to final polish by one woman in her Brooklyn studio. The fact that I have control over every aspect of the business means that I care about all my customers. If you have any requests or questions, send me a note. I am happy to work with you to make your piece perfect. Thank you for shopping Natural Abstract. Most items listed are already made and are almost exactly as they appear in the photos. Many of my pieces are one of a kind and all are limited edition. Payment- I accept money orders, checks and Paypal. You may use your credit card if you select the Paypal option even if you don't have an account. Checks and money orders must be received and verified before item ships. I prefer postal money orders. Shipping- I am almost always able to ship items within a few days. 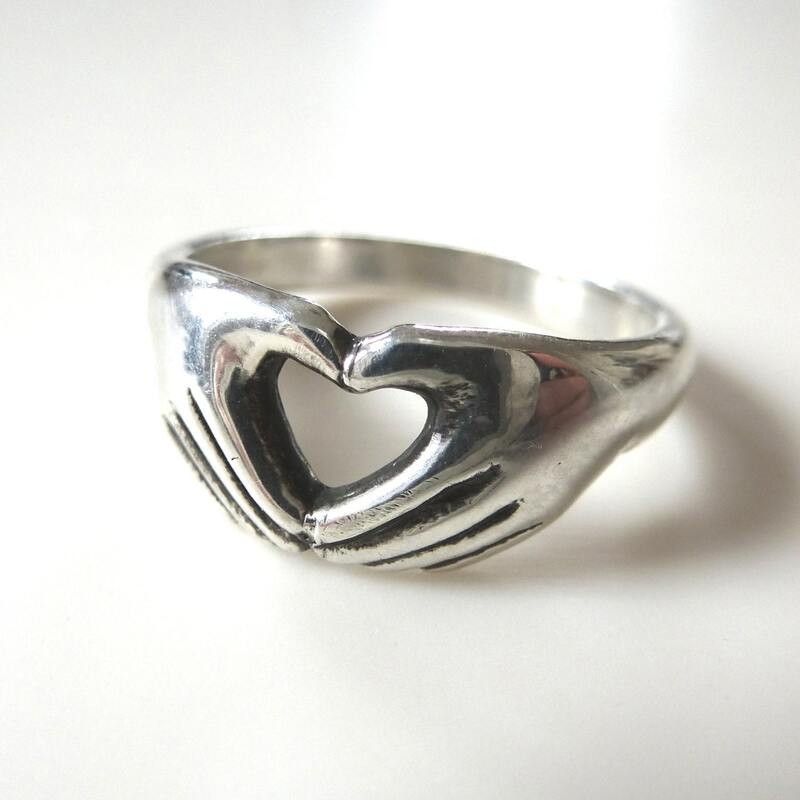 Custom made rings may take up to a week but I am usually able to make your order within a few days. If your item requires more time I will let you know. I ship USPS priority. Your package will usually arrive 3 to 5 business days after being shipped within the US. All items will be packaged in a cotton filled box inside a bubble envelope. Items $100 and over include insurance. If you prefer a different or faster shipping method please let me know. I am not responsible for items lost in the mail. I also ship internationally. Mailing times vary for each country and I can't promise specific arrival dates. Please note that international buyers are responsible for any and all duties and customs charges that may be incurred. Refunds and Exchanges- My primary concern is your happiness. I will give refunds within 30 days of mailing minus a 10% restocking fee to cover shipping costs and etsy/paypal fees. I am happy to make exchanges, at no cost, within 60 days. If you order the wrong size on a ring, I will make an exchange only if the ring returned is between a size 5 and 9. No returns on custom made rings. Please triple check your size. If any item breaks due to defect at any time, I will repair it free of charge if all pieces are returned. Custom orders may not be returned or exchanged unless defective. I will send pictures of any custom order before shipping and work closely with you on your exact specifications so you know exactly what you will receive. Please wear your jewelry responsibly and triple check your size. The ring was beautifully crafted and fit perfectly! This piece is so simple and sweet, you can feel the love in the craftsmanship the second you open the box. I adore it, as does my best friend who says, "I love it, I will wear it forever." This ring is absolutely gorgeous, and exactly the design my partner has been looking for. It fits perfectly on her ring finger and is a great alternative when not wearing her engagement ring. However, she is super sensitive to sterling silver, and within 24 hours of wearing the ring, her finger was green. This was very disappointing given the good quality craftsmanship (durable, heavy, and smooth). However, we've decided to keep it, for the days we are out camping or somewhere where her diamond needs to stay safe at home. Thanks much!